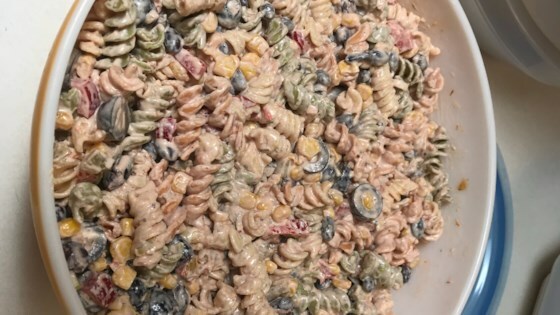 "Your family and friends will love this zesty pasta salad. A surprising change from traditional pasta salads. Ole!" Bring a large pot of lightly salted water to a rolling boil; cook the rotini in the boiling water until the pasta is cooked through yet firm to the bite, about 8 minutes. Drain. Rinse under cold running water until completely cooled; drain thoroughly. Whisk the salsa, mayonnaise, sour cream, black beans, Mexican-style corn, red bell pepper, green onions, black olives, garlic powder, cumin, cilantro, salt, and pepper together in a large bowl; add the cooled pasta and stir to coat evenly. Cover the bowl with plastic wrap and refrigerate 2 hours to overnight before serving. What a pretty pretty dish. I doubled it and loved it. I think my guest will really like it tomorrow for our taco dinner. Thanks for sharing. Made this one exactly as recipe says, minus olives, and it is SOOOOOO good. The family loves it It is a keeper! All I can say is FABULOUS! I did not have cilantro and added maybe only 1/2 the olives. Just a pinch of cayenne. Not a waist watchers but so yummy!